Jeffrey Lockridge, a graduate student in ASU's School of Earth and Space Exploration used new seismic data collected as part of the EarthScope project to develop methods to detect and locate small-magnitude earthquakes across the entire state of Arizona. Many parts of the state had never been sampled by seismometers prior to the deployment of the EarthScope USArray, says Lockridge. One-thousand earthquakes over three years may sound alarmingly high, but the large number of earthquakes detected in the study is a direct result of the improved volume and quality of seismic data provided by EarthScope. 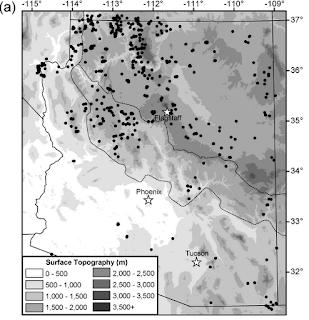 Ninety-one percent of the earthquakes Lockridge detected in Arizona were "microquakes" with a magnitude of 2.0 or smaller, which are not usually felt by humans. Detecting small-magnitude earthquakes is not only important because some regions experiencing small earthquakes may produce larger earthquakes, but also because geologists use small magnitude earthquakes to map otherwise hidden faults beneath the surface. 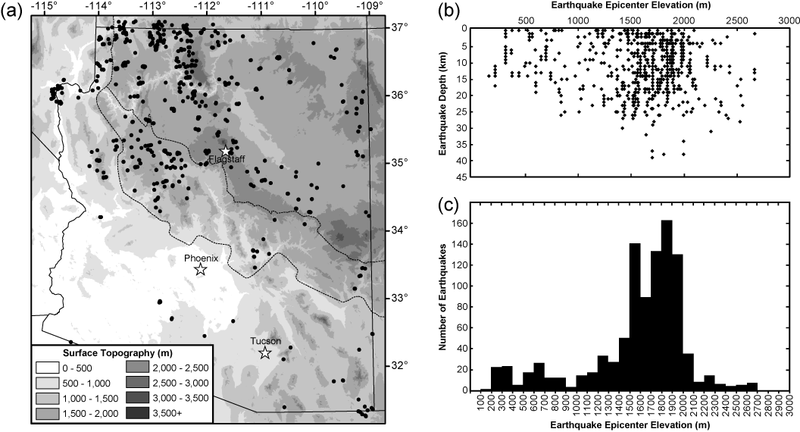 The results appear in a paper titled, "Seismicity within Arizona during the Deployment of the EarthScope USArray Transportable Array," published in the August 2012 issue of the Bulletin of the Seismological Society of America. Ramon Arrowsmith and Matt Fouch, professors in ASU‚s School of Earth and Space Exploration, are Lockridge's dissertation advisors and coauthors on the paper. "From April 2007 through November 2008, other networks detected only 80 earthquakes within the state, yet over that same time we found 884 earthquakes, or 11 times as many, which is really quite staggering," says Lockridge. Arizona has a variety of iron ore deposits ranging across the center of the state. There have been quiet exploration programs underway by a number of companies for the past several years. I offered a brief overview of the deposits to the Arizona Mining Association Board on Monday at their annual strategic planning retreat. AZGS Chief Geologist Jon Spencer provided these descriptions. The banded-iron formation (BIF) northwest of Prescott is comprised of quartz-hematite-magnetite rock precipitated out of slightly oxygenated ocean water 1.7 billion years ago [right, circled area in the center of the state]. Ore-grade BIF rocks are referred to as “taconite.” This is the same type and age of rock that forms the huge iron deposits in the Lake Superior region. The Buckskin and Plomosa replacement iron deposits [right, western Arizona] were produced by basin brines ascending along fault zones during middle Tertiary tectonic extension. Many of these deposits also contain copper that was mined in the early 20th century. The Copperstone gold deposit, also one of the replacement iron deposits, has been mined intermittently since the 1980s. Both the Apache bedded iron in the Mesoproterozoic Mescal Limestone [right, northeast of Phoenix] and the Seligman replacement iron in the Devonian Martin Limestone [right, south of I-40] formed where reactive limestone was intruded by basaltic igneous rocks. 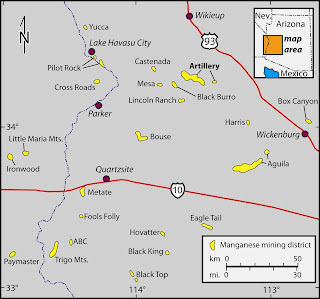 The magnetite placer deposits [between Phoenix and Tucson] are magnetite heavy-mineral sands in modern washes and Quaternary alluvium. These were derived from Precambrian granitic rocks that contain abundant magnetite. Sands contain up to 15% magnetite. Commercial iron production from magnetite placer sands was attempted in the 1960s but did not prove economic at the time. I gave the opening talk at the Arizona Mining Association's annual board meeting and strategic retreat the other day, describing some of the exploration underway around the state for minerals other than copper, gold, and silver. One of the most interesting targets is for manganese, a metal critical to the manufacture of steel. 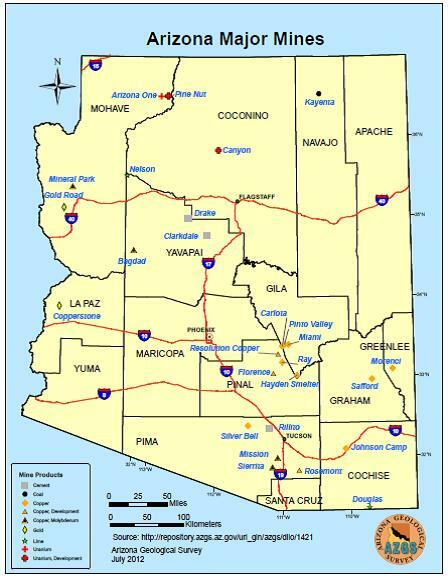 Arizona produced almost a quarter billion pounds of manganese but not only is none produced today, there is no manganese produced anywhere in the US. All manganese used in the US for steel production (and certain aluminum products) is imported. The National Academy of Sciences ranked manganese as a strategic and critical mineral highly vulnerable to supply disruption. The global demand for manganese increased in the past half decade, in part driven by rapid development in China and other emerging economies. Jon says most manganese concentrations are bedded and are thought to be detrital, with manganese washing in with the Miocene (8-12 Ma) sand and silt. Some deposits are vein and fracture filling, but most are bedded. Some disseminated ore may have been introduced by low-temperature hydrothermal fluids that also deposited very minor barite and calcite. A US government manganese stockpile sits next to the railroad tracks outside of Wenden in La Paz County, western Arizona. This stockpile was the result of the US government manganese buying program in the early 1950s, and is the repository of most or all of the manganese produced from the surrounding manganese districts, including the Artillery manganese mining district. Congress recently authorized sale of the stockpile. There is an exploration program underway in the area by American Manganese Co. 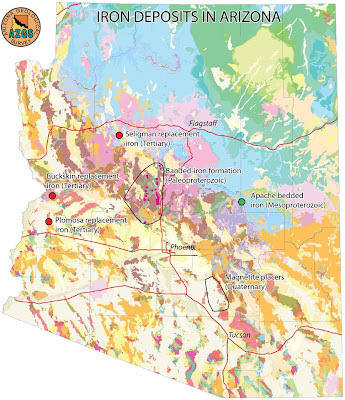 The Arizona Section will be hosting the 2014 Association of Environmental and Engineering Geologists (AEG) Annual meeting in Scottsdale Arizona at the Doubletree Hilton from Sept 20-28, 2014. They expect more than 400 participants from all across the country. There will be numerous technical sessions, poster presentations, exhibitor booths, and field trips. Jessica Humble and Pancho Garza agreed to serve as co-chairs for the meeting. 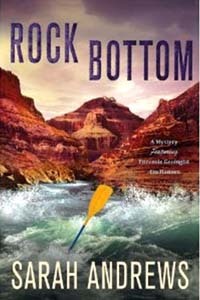 Sarah Andrews new geology murder mystery, "Rock Bottom," was released last week and is set on a raft trip down the Grand Canyon. I haven't gotten my copy yet, but in conversations with Sarah over the last year, count on the geologic setting and details to pass the muster of the most discerning Arizona geologist. This is 12th in the series featuring geologist Emily ("Em") Hansen as the sleuth. For you trivia hounds, I have a brief walk-on role in "Bone Hunter" and am the thinly disguised murder victim in "Fault Line." Sarah's going to be in Phoenix in mid-October for an appearance and book signing. We're hoping to have her do a book signing in our Tucson store in October as well. Stay tuned for details. The public approval rating of Congress is in low double digits, and Katie Sweeney is surprised that it's that high. Katie is General Counsel for the National Mining Association and gave the dinner presentation last night to the annual meeting of the Arizona Mining Association Board in Sedona. She described a Congress that has been deadlocked for more than a year in anticipation of this year's elections. As a result, the political dynamics in Washington DC are much different than what we're used to. Instead of groups pushing legislation to advance their agendas, the focus has shifted to trying to affect policy changes through regulations and actions by Executive Branch agencies, including those addressing mining and related issues. One example is the Secretary of Interior's administrative withdrawal of 1 million acres of federal lands in northern Arizona from exploration and development. Katie said that anti-mining and environmental groups see this a breakthrough approach that can be used in many other situations. Currently there are four lawsuits filed against the Secretary's decision, with NMA party to one of those. The judge hearing them has consolidated them into one. In October, the judge will consider requests from supporters of the mining ban to toss out the suits. If the suits go forward, the plaintiffs will be asking for a judgement on constitutional grounds (if I understand correctly, the basis is that the argument that the Secretary cannot take such significant actions without Congressional authorization). Otherwise, the case could revolve around the scientific bases for the decision and become a lengthy debate. 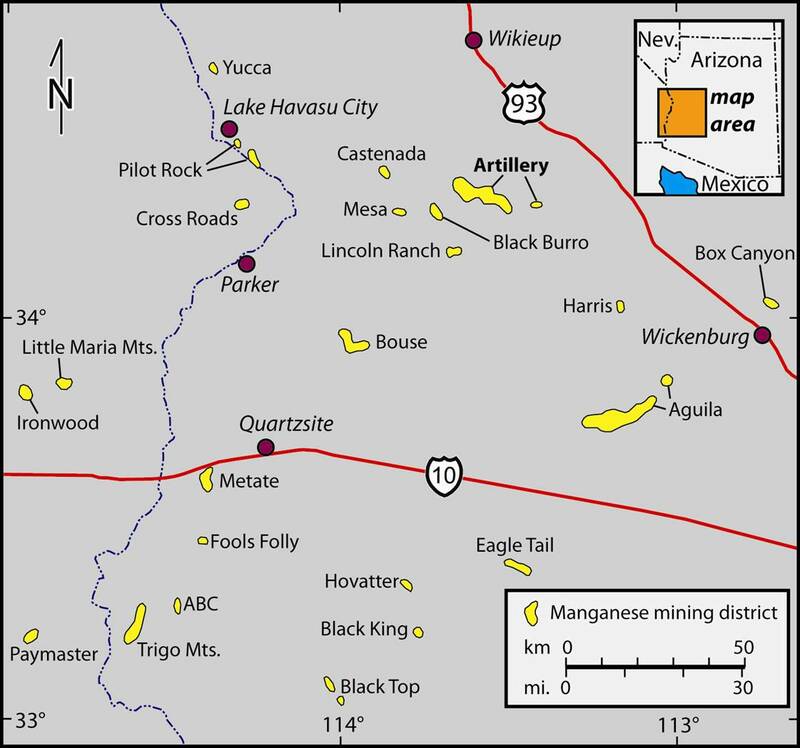 [Right, uranium exploration core hole in northern Arizona. Credit, Vane Minerals]. Thus, it seems to me that the Arizona uranium case could have much wider ramifications. Regardless of which party wins the White House, a divided Congress is a good possibility, with legislation stymied. If that's the case, the present situation may be the new normal. 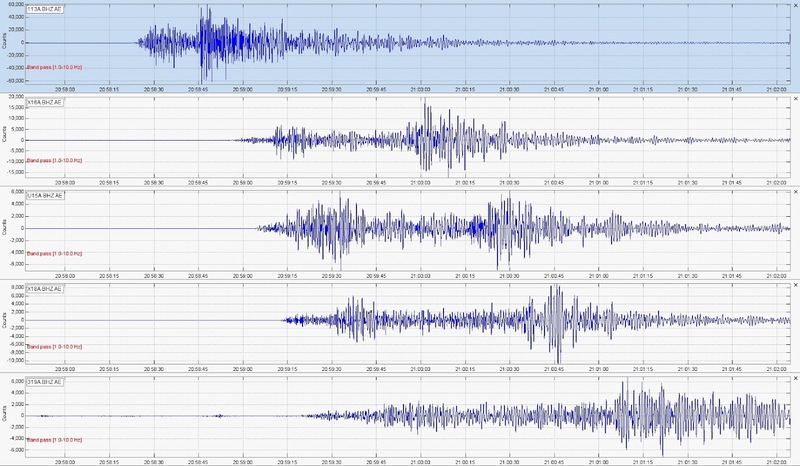 The Arizona Broadband Seismic Network, run by AZGS, is recording the earthquake swarm following the magnitude 5.3 and 5.5 quakes near Brawley south of California's Salton Sea. Dr. Jeri Young, in our Phoenix office, forwarded the image at right of most of our stations, including 113A, our closest station to Yuma, that have captured the M 5.3 Brawley event. Our 113A station is about 60 km east of Yuma and about 165 km ESE of the 5.3 epicenter. 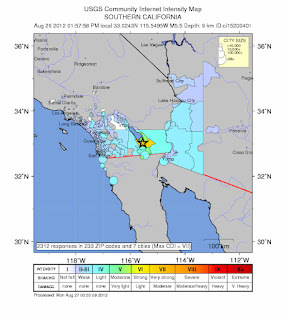 The quake was picked up (first P arrival) by this station at about 25 seconds after the first shock at 19:31:47 UTC and 12:31:47 MST. A magnitude 5.5 earthquake struck the Salton Sea area of southern California just before 2pm local time today, and was felt from Yuma to Bullhead City. 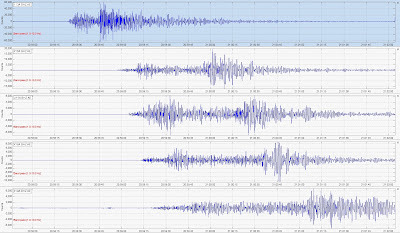 There is a continuing swarm of aftershocks with the largest so far apparently a M4.8. A magnitude 5.3 event hit at 12:32 pm today in the same area - a foreshock? What's happened to our summers? It wasn't that long ago that summer was time to step back, take a deep breath, catch up on things, and maybe even take some time off. Schools closed, the Legislature adjourned, lots of people went on vacation, so meetings and conferences were not scheduled until after Labor Day. But that's been changing year by year as this century zooms by and now summer is just as frantic as the rest of the year. And on top of that, everything is now faster and non-stop year-round. We are expected to be on 24/7. No matter where you are, you should be connected and responsive. So, this summer, which is nearing its official demise, has been a blur and exhausting. Reports with impossibly short deadlines, project reviews, budgets, conferences, meetings, interviews, inquiries, non-stop travel, higher expectations, more and more funding proposals to try to keep the lights on and bills paid. We've become real-life hamsters on the wheel, spinning faster and faster. 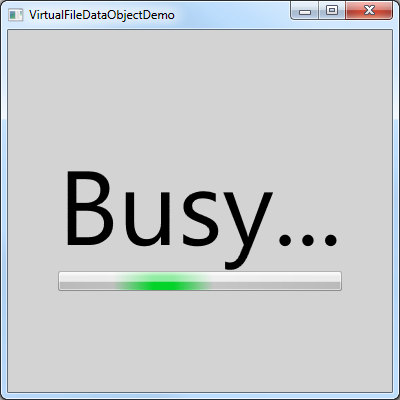 I prided myself on being able to carve out a few minutes most days to blog a bit as a release but early this Spring, blogging became more sporadic and there have been long gaps. Yes, it's my own fault. It's tough to unilaterally call a cease fire in the battles for time. Perhaps if all of us pulled back, there were fewer temptations and demands. But that's not going to happen for as long as I can see. So, 8 pm Saturday night and I'm not sure which task to do next - review the funding proposal, write a section for the informatics report, edit slides for my Monday talk, or just reply to some of the 450+ emails that still need an answer. Blogging feels like I'm goofing off. AZGS has updated the Arizona Major Mines map, which shows major active mines of copper, gold, lime, coal, uranium and molybdenum. It's posted online free downloading at our document repository. 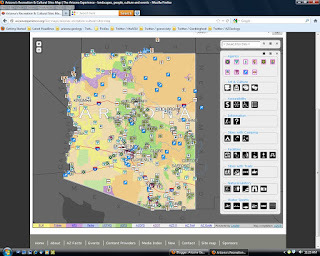 The popular ACERT map (Arizona Council for Enhancing Recreation & Tourism) is now online as an interactive map with over 425 locations and more being added. 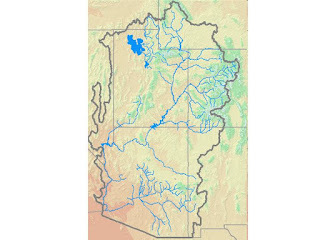 AZGS produced the map in partnership with the ACERT and Arizona Office of Tourism, and hosts it on the Arizona Experience website, which we publish. 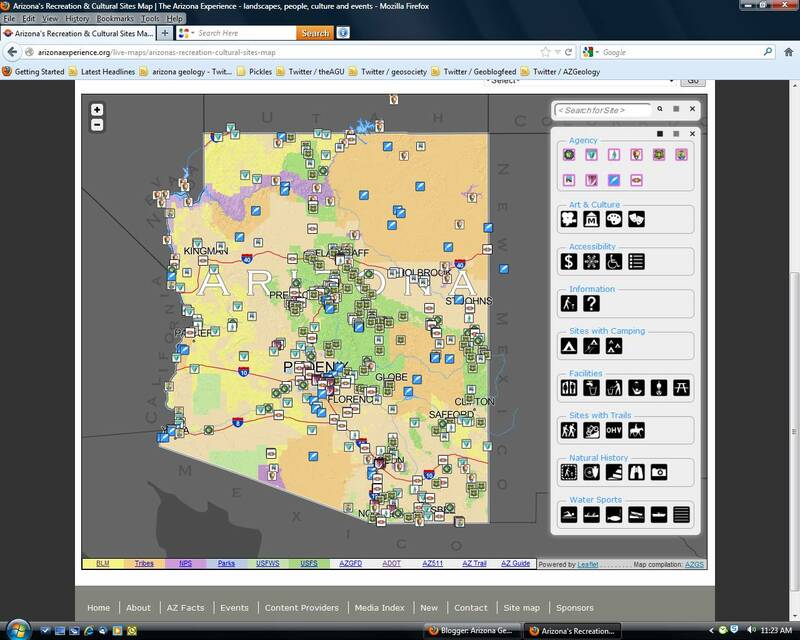 It’s an interactive map for exploring recreational, historical, and cultural sites in Arizona. It includes federal parks and monuments, federal recreational areas, federal and state wildlife refuges, state parks, tribal lands, American Indian cultural sites, museums, art galleries and theaters. You can find places to hike, camp, picnic, bicycle, boat, visit a museum or theater, and shape your next Arizona experience. 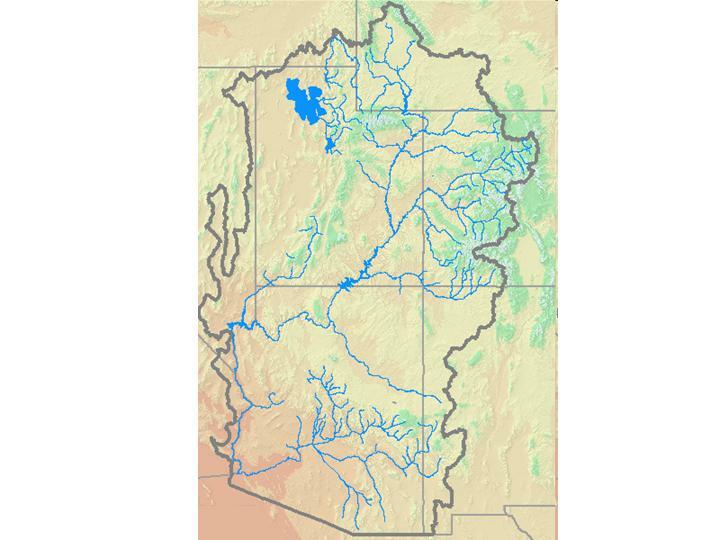 Acknowledgements:The Recreation & Cultural Sites Map is a joint product of the Arizona Experience, the Arizona Office of Tourism, and the Arizona Council for Enhancing Recreation and Tourism (ACERT). A magnitude 3.0 earthquake was reported at 11:22 pm Friday night local time, about 26 miles west of Page, Arizona, just south of the Utah border. A magnitude 2.8 quake occurred just southeast of Page about 18 hours earlier. The map at right, from the USGS, shows the epicenter (orange star). The National Park Service has openings for two geologists in their Lakewood (Denver) Colorado office. But move fast - applications are due by August 29. The positions are located in the Natural Resource Stewardship and Science Directorate (NRSS); Geologic Resources Division; Geologic Features and Systems Branch. The incumbent serves as a technical advisor in geology for one or more parks. The geologist is responsible for program development and implementation related to geology, hydrogeology, paleontology, geomorphology, cave and karst resources, mining, oil and gas development, erosion control, and other related activities. The primary emphasis of this position is writing, editing, and making available publications related to the National Park Service’s Geologic Resources Inventory (GRI). Another position as Technical Writer/Editor is located in the Natural Resource Stewardship and Science Directorate (NRSS); Geologic Resources Division; Geologic Features and Systems Branch, whose primary duties involve editing and making available publications related to the National Park Service’s Geologic Resources Inventory (GRI). The position edits material relating to National Park Service geology, the GRI, and geologic resource management issues, including manuscripts, reports, informational papers, posters, brochures, and various forms of correspondence. As copy editor and proofreader, identifies problems in style, grammar, clarity, and other editorial considerations. Determines design and layout style and format to be used in publications ranging from brief information papers to multi-author, multi-section reports that vary from dozens to several hundred pages in length. Maintains and modifies GRI report templates using the style guidelines of the NPS and NRSS. Is independently responsible for ensuring that all format and style guidelines and layout-related directions are correctly adhered to in final documents. Uses desktop publishing software to design attractive, reader friendly reports and articles. Develops new and edits existing geologically accurate and relevant graphs, figures, tables, and photographic images to translate scientific results for the semi-technical or broad audience. Compiles and creates park specific GRI product CD’s for distribution with final GRI reports. Obtains cost estimates for report production supplies and arranges for the production of reports. Prints and binds a limited number of hardcopy GRI reports for distribution to parks, networks, and regions. Produces and transmits final electronic copies of text and supporting illustrations, tables, photographs, and/or figures to the GRD Webmaster for inclusion on Division webpages.